Mary Young, 1909. Photo by Lewis Hine. Mary Young was born on December 15, 1897, according to several sources. She was the oldest child in the family that went to the orphanage. 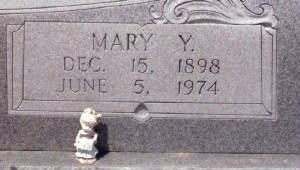 She stayed there for about a year and was taken, but not adopted, by Thomas and Mary (or Mollie) Moore on April 9, 1910. She was 12 years old. Mr. Moore was 72, and Mrs. Moore was 65. They owned a farm in Jenkins County, Georgia, probably near Millen, the county seat. Mary married Samuel Manuel Peter Virgil Williams in 1913. She was about 15, and he was about 17. They lived on a farm, probably as sharecroppers. By 1920, they were renting a farm in Green Fork, Jenkins County. 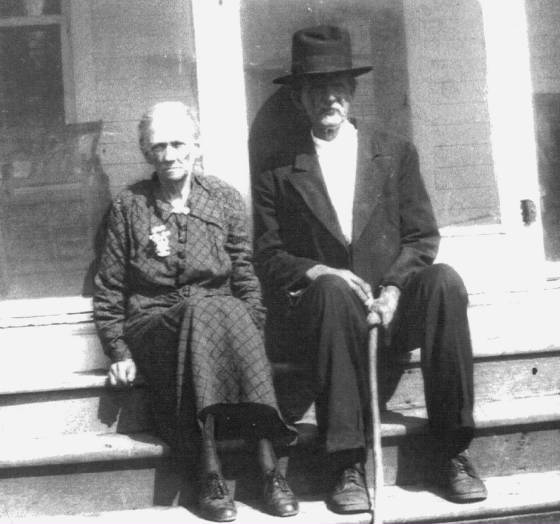 In 1930, they were living on a farm in Millen. They also lived in Waynesboro. They had 11 children: Jesse, Jannie, Charles, Rosa, Roy, Crawford, Annie Lou, Alex, Ceabron, Mary, and a boy who died as an infant. Mary Young Williams and husband Samuel, 1948. 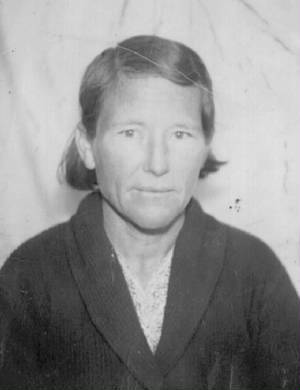 Mary died in Millen on Jun, 5, 1974, at the age of 76. Listed among her survivors were siblings Seaborn and Eddie Lou. Mattie and Elizabeth, still alive, were not listed. Husband Sam died four years later. 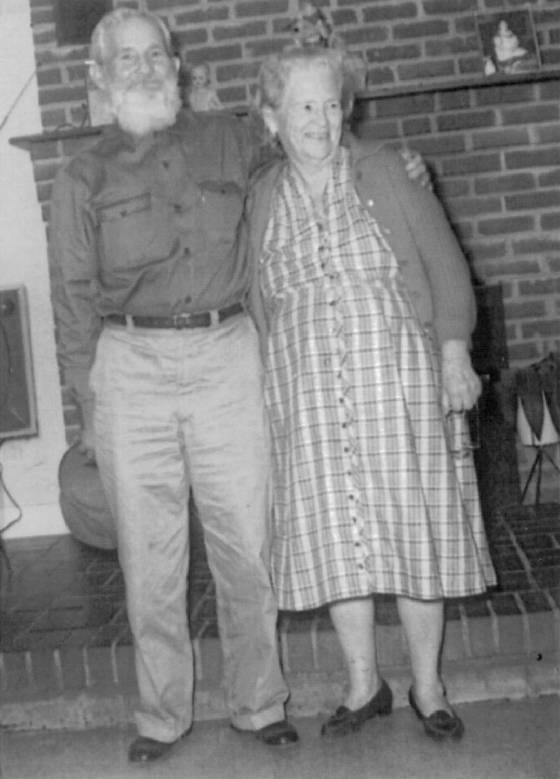 Mary Young Williams and husband Samuel, 1953. I interviewed Mary’s daughter, Annie Lou Burke, and Mary’s granddaughter, Runnette Smith. Edited interview with Annie Burke (AB), daughter of Mary Young. Interview conducted by Joe Manning (JM) on February 14, 2011. JM: How many children did your mother have? AB: She had 11 children, six boys and five girls. JM: Where were your parents living at the time you were born? AB: Somewhere out on the edge of Millen. We moved a lot of times. During the Depression, we didn’t have a whole lot to eat. On many a day, we went without food. When the government farm programs started about 1935, they put my daddy on a farm. It’s a coincidence that I’m back living on that same farm now, since he never owned it. We lived here for two years, and then we moved farther back out in the country towards the Green Fork section. We lived there about five years, and then we moved down to the Big Horse Creek area. I lived there until I got married in 1946. My parents moved several more times after that. They went to Waynesboro and stayed about 10 years, and then they moved down here on our place and Dad bought a little piece of land and built a house. My daddy always did farm work. JM: Did your mother ever work outside of the home? 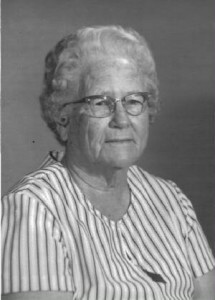 AB: She worked in the Thompson Company sewing plant in Millen and at Samson (curtain manufacturers) in Waynesboro. I was already married when she did that. Until then, she stayed home and farmed. I quit school and started working in 1944. I was 17 then. JM: What did your mother tell you about her life as a child? AB: Not very much. My mother told me about the day she and her brothers and sisters went to the orphan’s home, and how she was crying. She said she had helped with the baby all day, and then she never saw her again. They must have all been together in the orphan’s home, because Mama talked about them eating at the same table. I told my Mama that her mother had no choice, because back then, when they stopped the kids from working in the mill, there wasn’t any way they could make a living. So that’s when she gave them away. JM: How did your mother feel about being left at the orphans home? AB: She hated her mother for doing that. She hated her all of her life till one day I just couldn’t take it no more. I just told her that God would never forgive her until she forgave her mother. Her mother was already dead by then. JM: How did she react to what you said? AB: Very good. After that, I never heard her say anything it. JM: Did you know your grandmother, Catherine Young? AB: I saw her twice. As far as we were concerned, she was just a stranger that came to see us. The first time she visited, it had been 40 years since Mama had seen her. JM: Did she tell you anything about her father, Jesse Young? AB: She said she loved her daddy to death. He was sick a lot. He died here in Millen, and he was buried here, but we don’t know where. JM: Did you know Ella, one of the older children that wasn’t in the picture? AB: I’ve never heard of her. What Mama had told me was that her mother had daughters named Georgia, the oldest girl, Mell, Mattie, Mary, Eddie Lou and Elizabeth. Her sons were Elzie, Alex, Jesse, and Seaborn. Alex lived in the orphan’s home till he got grown, and then they had to put him out. 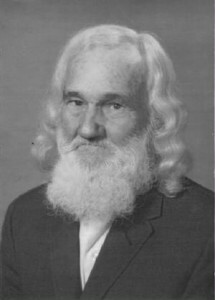 Elzie died of pneumonia in World War I. When he was about 16 or 17 years old, he ran away and joined the Army. Alex lived in Macon most of his life, as far as I know. JM: Did you know Seaborn? AB: I saw him once. My mama brought him by my house for about an hour one day, and that’s it. JM: Did you know Jesse? AB: I never saw him. The only ones I saw were Alex and Eddie Lou, and Seaborn that one time. Mama wasn’t financially able to hunt down her brothers and sisters. We never had a way to go, except in a wagon. They lived way down in South Georgia, and we lived up here, so we didn’t have any contact with them once they left the orphan’s home, and nobody contacted Mama. She wasn’t in contact with any of them for 40 years. Some of them lived down around Baxley. Eddie Lou lived over around Plains. JM: Did you know that Mattie moved to Fresno, California? JM: What was your mother like? AB: She was jolly. She’d have her good days and bad days, but most of the time, she was upbeat. I miss her totally. She taught me everything I know. JM: How did your family survive, being so poor and having so many children? AB: Very narrowly. God took care of us. God has always been on my side. JM: Were your parents very religious? AB: I can’t say that they were very religious. My parents feared God, but we couldn’t go to church because we didn’t have any clothes or shoes to wear. And the only way we had to travel was in a wagon. JM: Did all of your brothers and sisters grow up healthy? AB: Yes, but when we got older, seven of us had open heart surgery. JM: Are there any other children still living? AB: I have one brother and one sister who are younger than I am. JM: Did any of them go to college? AB: No, we didn’t even finish high school. My daddy was a very smart man. We came from poverty, but I’ve had a good life since I married. I worked beside my husband on the farm day and night. Whatever needed to get done, I was never too good to do it. I’ve done everything from picking cotton and chopping cotton to milking cows and even fixing hair. I had my own beauty shop for about 40 years. My mama raised a good family. She taught us respect, work and manners. They were hard parents, strict parents, but I’m glad I had that kind of parents. Edited interview with Runnette Smith (RS), granddaughter of Mary Young. Interview conducted by Joe Manning (JM) on April 28, 2011. JM: What did you think of the pictures I sent you? RS: They’re fascinating. They were a real gift. I was born in 1945. Ever since I was a child, I guess, I’ve wanted to learn about the Young family and my grandmother’s background. That’s finally happened. JM: Were you close to your grandmother? RS: I lived near her most of my life. JM: Did she ever tell your anything about being a child? RS: She didn’t talk about it a great deal. I knew that she was pained all her life about being adopted. She lost the tip of her middle finger on her right hand while working at a textile mill in Millen. She was only six years old when it happened. I don’t know what the mill was called then, but it was later called Thompson Company (It was called Millen Cotton Mills when Mary worked there). So when she was photographed in Tifton, she had already been working in the mills for quite some time. JM: Did you know that she lived in Tifton? JM: Did you know that her father died young? RS: Yes. I heard that he died of TB. JM: Did your grandmother say anything about going to the orphanage? RS: She said it was a terrible experience for her. She was very bitter toward her mother, even when she was in her sixties and seventies. My mother, Rosa Mae, and my aunts would tell her that her mother was desperate and didn’t have any choice, but she would reply, ‘Oh yes, you always have a choice.’ My grandmother was so hurt by it, that I think it affected the way she treated her own grandchildren. She wasn’t mean to us, but there was some detachment. She would tolerate us to a point, but we were supposed to be quiet. Because she had been put in an orphanage, she was very determined to keep her children together. She told my mother that the children would have to starve before she would give even one of them up. Most of them had very little formal education. It didn’t seem to me that my grandmother valued education very much, but my mother did. My mother told me that she didn’t go beyond the third grade because she had to work on the family farm. I am one of eight children. At one point, about five or six of us were sent to stay with my grandmother for a short time, because my mother had to work in the textile mills and couldn’t take care of all of us. I remember not feeling welcomed. I always felt like it was because my grandmother had been through so much for so many years, that she didn’t want to take on more children. She was just beginning to feel some relief because most of her children were not in the home anymore. And she was still working at a textile mill and also taking care of a farm. JM: Did she ever see her mother after she was adopted? RS: Yes, I was told she did. I also heard a story about Catherine. At one time, she had gone to find her children. She went to see Alex, her oldest son, where he was working. She stood by his car and waited for him to get off work. When he came out, he refused to talk to her and walked the other way, because he was also bitter about it. Thomas and Mary (or Mollie) Moore, 1911. JM: Did she ever mention the people who adopted her, Thomas and Mary Moore? RS: The only thing I ever heard her say was that she felt like she had been adopted just to serve them, to do what they needed to have done. They were an older couple, I believe. On her tombstone, Mrs. Moore is called Mollie. JM: That’s correct. In 1910, when they adopted her, Thomas was 72, and Mary was 65. They were farmers. Your grandmother was probably not officially adopted, because her name was still Young in the census. She got married about 1913, according to the 1930 census. RS: She married on April 16, 1913. So she was only about 15 when she married. Her husband was 17. She went from one bad experience to another. RS: He was a very hard worker, very quiet, and even more detached than my grandmother. He would allow you to hug him, but he wasn’t really that affectionate. I don’t remember ever having a conversation with him. 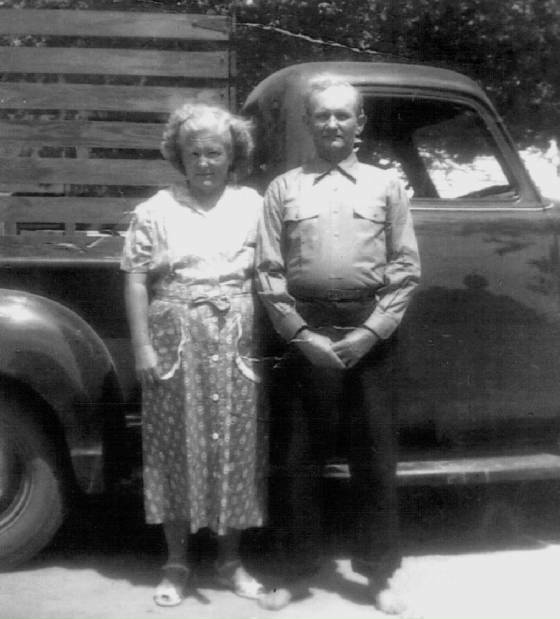 Both my grandparents were very hard workers. My grandmother was a very neat woman. And she wanted us children to be neat also. She was a wonderful cook, and she could sew. I remember that she always dipped snuff and loved to read True Confessions Magazine. My mother was born in 1921. She eloped and married at 16, and had a baby at 17. She always regretted not having any education. She was a physically strong person, and helped out her father a lot. She told me that she had to help him saw logs and stuff like that. She liked to work outside, but sometimes, she thought her brothers should be doing it instead, so she could stay and help her mother. JM: Was your grandmother in good health until she died? RS: She had been in declining health. She had a heart condition. My grandfather lived four more years after she died, and he also had health problems. But they were tough. The main thing that I admired about them was that they were very independent people. They were well-liked in the community. They were poor, but certainly had their self-respect. 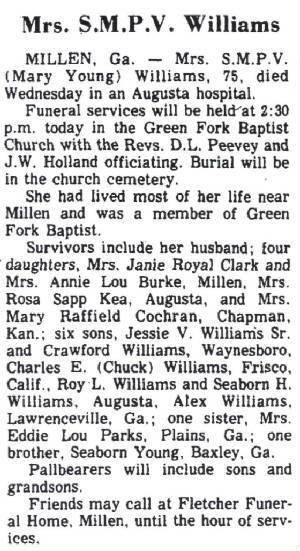 RS: They’re buried at Green Fork Baptist Church Cemetery. I went to that church as a child, and I still do, but I don’t remember ever seeing them in church. But my mother always taught us children to have reverence for God, and that probably came from my grandmother. When I look at that child labor picture, I think about the fact that only one of the children was wearing shoes. Women back then had very few ways to make a living. There was no welfare and no day care assistance. It would have been awfully hard for their mother to survive and support her children. But knowing what I know now, it’s amazing to see how children can keep going in the most oppressive situations and get on with their own lives. Published June 7, 1974. Correct age at death is 76. Gravestones side by side at Green Forks Baptist Church Cemetery.